I am back in Chicago for a bit, and have managed to make it out to Wrigley Field twice to see Fukudome Kosuke, the first Japanese addition to the Chicago Cubs roster. Readers will recall that I was quite pleased about this, and so far I haven't been disappointed. With a .317 batting average and .431 on-base percentage (and one of the highest pitches-per-at-bat averages in the National Leage), how could I? 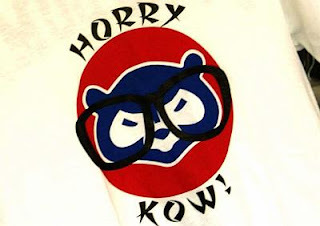 What I am disappointed, nay, ashamed about is the behavior of some Chicago Cubs fans in regard to Mr. Fukudome. Cubs fans have a reputation for being drunken layabouts (cf. Lee Elia), more interested in the Wrigley Field atmospherics than the game on the field. Marty Brennaman, Cincinnati Reds broadcaster, made this point earlier this week after an incident in a game between the Cubs and Reds, and at times I have a hard time disagreeing (despite being a Cubs fan myself). But in addition to being obnoxious on occasion, are Cubs fans also racist? The arrival of Mr. Fukudome in Chicago has been largely but not entirely incident-free, but the Chicago Sun-Times reports that some horribly offensive Cubs-related merchandise is selling heavily around Wrigley Field. I saw the t-shirt in this picture on a fan sitting a few seats away from me on Friday afternoon. Mr. Fukudome was restrained in his comments on this merchandise. "I don't know what the creator of the shirt meant this to be, but they should make it right," Fukudome said through his interpreter after being shown one of the shirts Thursday. "Maybe the creator created it because he thought it was funny, or maybe he made it to condescend the race. I don't know." I will be less restrained. This kind of thing is embarrassing in the twenty-first century: I am embarrassed as a Cubs fan, a Chicagoan, an American, and as someone whose life is spent, well, observing Japan. I don't want to generalize about Cubs fans or Chicagoans — Mr. Fukudome's reception in Chicago has been quite friendly, and fans besieged the Cubs organizations with complaints about these items, prompting the team to stop their sale — but the fact that people find this sort of thing funny or cute is a blot on the US. I don't think it's a product of outright racism, just ignorance. But that ignorance is wide and deep, and is not without consequences for US foreign policy. The stunning ignorance about other countries — allies and "enemies" alike — means that ugly stereotypes like this have survived for far too long. (And then there's the question of the older generation of Americans, some of whom revert to embarrassing stereotypes of Japan perhaps in large part because their images of Japan were shaped by a horrendous race war.) Knowledge about Japan among Americans of all education levels is shockingly poor, allowing offensive (or dated) stereotypes to persist. Perhaps I shouldn't take this so seriously, but it's that kind of attitude that allows this behavior to persist. A person wearing a shirt like this should be stigmatized. It's small incidents like this that speak volumes about America's place in the world in the twenty-first century. I could not agree more. As a resident of Wrigleyville (and Cubs fan), I am constantly appalled at the behavior of said fans, and their inane attempt at humor regarding Fukudome is not out of character, I fear. Although I think that Brenneman was a bit over the top in his criticism (he did, after all, once refer to a Reds road trip as "the Bataan Death March), there is a plethora of knuckleheads who attend Cubs games. To be fair, Americans are far from the only ones with only very superficial and stereotypical views of other cultures. I doubt very much the typical Swedish person knows any more about Japan; I readily confess that I knew almost nothing about the place or the culture when I came here (and I'm supposed to educated and all). And ask most Japanese - ordinary people, not political pundits or otherwise interested - and they'll have no deeper knowledge about the US (to say nothing about a place like Sweden). It's only natural, really. When we don't know about something specific, we try to generalize from what we do know. Life is too short to learn the details about everybody and everything; we must generalize. Which doesn't excuse flaunting your ignorance on racist T-shirts of course, but it does mean that most people, in most societies, will not ever have anything but the most cursory knowledge of other cultures than their own. This problem has been resolved as a result of fans rising up as one to have their voices heard, and the Cubs organization taking swift action. These shirts will no longer be sold. You're absolutely right, and I should have made clear that I recognize that American ignorance is not unique. However, for most countries the consequences of ignorance of other cultures is limited. Can that be said for the country that spends more on its military than all other countries combined? I did not see that Brenneman used that phrase "Bataan Death March," which I guess makes my point in an oblique way. "And ask most Japanese - ordinary people"
Not sure about this - I think that most Japanese over 20 would be able to name at least a half dozen US states or cities and most likely the US presidential hopefuls. There was a survey in the mid-1990s in which Americans were asked to name famous Japanese and the top results were - "Godzilla", "the Emperor", and "Bruce Lee". Canadians are regularly appalled to discover that many Americans do not even know the capital of their closest neighbor and a major ally. Perhaps, to paraphrase Tolstoy, each ignorant people is ignorant in its own way. This article ties in to this discussion. The article itself is amazingly bad, but the fact that the comments are largely devoted to taking the guy to task is a good sign for the state of public discourse in the USA. Things may not be that bad. Yeah, I linked to it above in reference to what some older Americans think about Japan. It's hard to tell, isn't it? One sees encouraging signs from time to time, but it's hard to know how representative those encouraging signs are. In any case, the problem is not so much ignorance but a willful ignorance, a fierce desire not to know. The U.S. might not be the only one to be ignorant in other cultures but it IS the main one sparking these stereotypes. The best thing to do in a situation where you DON'T know something is to be quite and TRY to find out what its about or better yet just listen and don't go off what little you know, That attitude is known as the AMERICAN attitude and hence people always relate ignorance (when it comes to cultures and race) to Americans. "The stunning lack of ignorance about other countries. . ."
I'm a regular at Tokyo Swallows games and I must say, despite a reputation for being a somewhat drunkenly loutish bunch themselves, and the frequent complaints of Westerners in Japan about ignorance-bred unintentional racism, I haven't seen anything offensive printed or displayed, or heard anything untoward said of any of the foreign players - ours or other teams'. This kind of punches a hole in the idea that familiarity with racial diversity reduces stereotypes and racism, it seems. Glad to hear that you're not alone in voicing your distaste for such items, though. Any idea if Japanese players joining teams in other cities have received similar treatment? To be fair (again), many people around the world can name various US states and cities because we've been inundated with movies and TV-series featuring them (to say nothing of the "Next US President" hit reality show). But take the Scandinavian countries, and Japanese are not much more likely to get the countries and capitals right than Americans are. And as for the US being a special case since it has a large military and a belligerent tendency to use it - the problem isn't ignorance; the US would be using its military capacity (has been using it, in fact) whether its leaders are enlightened cosmopolitans or not. The problem is the disproportionate capacity and willingness for violence, and that does not change with a more enlightened population. Brenneman's outburst was the topic of conversation between me and my father over the weekend -- I live in Tokyo and my old man is in the northern suburbs of Chicago (and a White Sox/Cardinals fan, to boot). He loved it, especially when Brenneman said St. Louis had the best fans in the league. I didn't realize that they were hawking such rubbish near Wrigley, not that it surprises me. Americans can be exceptionally ignorant when it comes to the world outside. But that's another story in itself. The conversation took an interesting twist when my father indicated he had "caved in" and bought a Toyota. He's a lifelong Ford man who steadfastly refused to buy anything Japanese because his cousin had been killed on Iwo Jima. His transformation from anti-Jap, buy-American hard hat to a more well-rounded human being has been a long, slow internal process. Perhaps he's softened a bit after exposure to my wife and children, and learning that my wife's father lost his dad somewhere in the Pacific during the same war. My father-in-law doesn't discuss the war or his childhood. We talk sports and politics, business -- normal conversation between men. I have no idea what he's thinking or if he has an anti-American bias. Getting back to the Toyota ... I asked my pop what he thought of the car. "Wow, it's a great car."